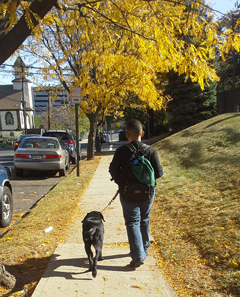 When Seeing Eye puppies reach the age of seven or eight weeks, they are delivered to the homes of volunteer puppy raisers who live within driving distance of The Seeing Eye. Puppy raisers are foster families, from all walks of life, who nurture and care for their charges until they are about 13- to 16-months-old. They teach the puppies basic manners and commands, and socialize them to a variety of social situations and experiences that range from shopping and car rides, to visiting airports and boarding airplanes. "What an amazing experience it’s been raising Wanda, our first Seeing Eye puppy. We thought it would be about us teaching her, but along the way, we’ve learned so much. Our 13-year-old son Caleb has assumed so much responsibility and showed us a maturity level that we never knew he had. He dropped some extra-curricular activities and committed to training Wanda. 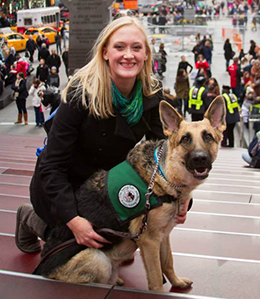 “The Seeing Eye puppy raising experience has changed my life. The year that followed my pup's arrival was the most rewarding experience of my entire life. He taught me more about unconditional love than anyone else ever could, made my heart swell with pride when he calmly let children cuddle him or navigated crowded city streets stress-free like a professional, and made me realize what a difference we both could make for someone who was in much more need of him than I was; we grew together, side by side, each day. “When we retired, we read in a newspaper article that The Seeing Eye was looking for people who would volunteer to raise a puppy. We watched a puppy demo at the County Fair and spoke with an area coordinator. We attended a few meetings of a puppy raiser club and soon knew that this was what we wanted to do. We worked with young people for 40 years and were delighted to experience young and old working together to raise puppies for The Seeing Eye. We are presently raising our sixth puppy and can honestly say that we have received as much as we have given. Daily walks, puppy outings, activities and demos have kept us healthy and fit. The puppies have enriched our lives and opened doors to new friendships. The most frequently asked question we hear is, "How can you give up a dog that you raised and love?" Our standard reply is, "We raised our children to serve others -- why not our dogs?"